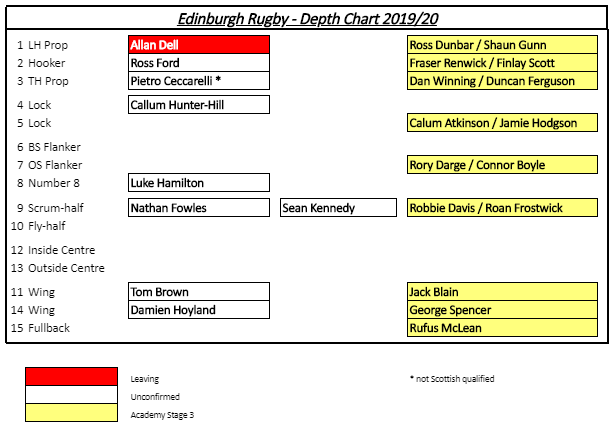 With Edinburgh’s recent flurry of signings taking them up to 40 confirmed full-time pros for next season this seems like an auspicious time to get an early look at how their squad is shaping up for the campaign to come. 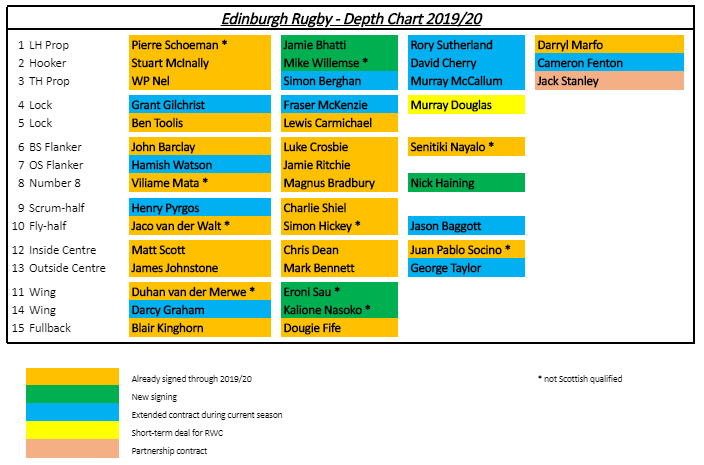 Yes it’s the not at all clunkily named ‘Official’ On Top Of The Moon Contract Status Depth Chart for Edinburgh Rugby 2019/20. At the end of last month The Offside Line reported that Edinburgh were close to re-signing 5 players. Hamish Watson, Henry Pyrgos, Simon Berghan and David Cherry’s new contracts have all subsequently been announced leaving Pietro Ceccarelli as the only member of that quintet still unconfirmed. The expectation would be that the big Italian tighthead will also be sticking around and he will complete the club’s business in the front row. Edinburgh appear a little light in the boiler room – especially with Gilchrist and Toolis strong candidates for a Scotland squad that will miss the first 5 rounds of next season’s PRO14. It looks like there is another name to come – Callum Hunter-Hill is a future Scotland international and will surely see his contract extended. The club can then call on two Academy players in Callum Atkinson and Jamie Hodgson who will benefit from having already been blooded during the current campaign, playing 7 games between them. With Murray Douglas available during the RWC Edinburgh may then have sufficient numbers in place at lock. The capital club’s breakaway options are laden with Test players. Which is great for the quality of the back row – when they are available. With the RWC cutting across domestic action and stripping out 4 or 5 of these men can Richard Cockerill’s budget stretch to renewing Luke Hamilton’s contract? Or bringing in a slightly cheaper player? Or with Scotland 7s resources like Ally Miller and Mungo Mason to call on (not to mention two of Scottish age grade rugby’s brightest prospects in flankers Rory Darge and Connor Boyle) does the head coach make do and mend for those early rounds before being able to recall his big guns by the time the Champions Cup action kicks off? The glaring gap in the group for next season is at scrum half. There have been no hints of either Nathan Fowles or Sean Kennedy having their contracts renewed. The only question is probably whether Richard Cockerill is bringing in one or two 9s to support Henry Pyrgos. The name most heavily linked with the role has been Nic Groom who has bags of experience with the Lions and Stormers in Super Rugby as well as Northampton in the Premiership. Charlie Shiel is an excellent prospect but with only 44 minutes game time this season he will most likely need to settle for (at best) 3rd in the rotation when 2019/20 kicks off. If Cockers does only bring in one scrum half hopefully Shiel will rack up some decent game time during 2019/20. Three of his teammates from the 2017 U20s have already won full caps (Blair Kinghorn, Matt Fagerson and Darcy Graham) so he’s got some catching up to do! Things look pretty well set in midfield – although the coaching staff will be praying for a bit better luck with the health of their players! Matt Scott and Mark Bennett started the 2018/19 season as the first choice pairing but after playing the opening 2 matches together that unit has not been sighted since due to both men’s terrible run of luck with injuries. There is massive potential in Edinburgh’s back 3 options – but also some risks too. Eroni Sau is a late developer and after graduating from 7s has only score 1 try in 800+ minutes for Perpignan in his first season of XVs. Kalione Nasoko has lit up the 7s World Series but has yet to really test himself in the extended format of the game. Might Richard Cockerill want to retain a bit of experienced cover in the shape of Damien Hoyland or Tom Brown? Or even go outside the current setup to add a 3rd new winger? If he doesn’t (and in fact maybe even if he does) then expect Jack Blain to break through as a serious contender extremely soon. Boasting the kind of power and pace that Scotland usually have to import on the wing he has already torn it up for Scotland at U18 and U20 level and is on the fast track to an extremely promising professional career. A squad of 44/45 seems about right with probably around 5 or 6 more bodies on top of that needed for that crucial 5 game World Cup period (loans and Scotland 7s players most likely). For a detailed look at Edinburgh’s squad at the start of the current campaign click here.